Several people have contacted me regarding the article in Wed. Nov. 8, 2006 NY Times: "The Secret of Great Bread: Let Time Do the Work." Although the techniques described in the recipe are not new to me, the combination of them was, so I stopped everything I was doing or planning to do Sunday late afternoon and threw myself into dough production. 20 hours later here's the report: The results are exactly as promised--very large holes in the crumb, light texture, thin crisp crust, and an absolute minimum of MIXING effort. As far as putting the dough into an extremely hot and heavy pot, I think I'll stick with other equally effective methods such as a heavy baking stone that holds the heat and ice cubes tossed into a preheated cast-iron pan or perhaps the new device I'm testing that has a relatively light-weight metal lid that also gets preheated and a very effective steaming device to create steam contained by the lid. The flavor of the bread developed during the long 12-18 hour fermentation (I gave it 15 hours) was indeed superior to a shorter rise with higher amount of yeast but not as good or as deliciously complex as when I add some of my old starter. Also, I would add my usual 7 to 8 % whole wheat or kamut flour for extra flavor and no compromise in texture. I like the ease of minimal mixing coupled with long slow rise which develops the gluten more gently resulting in the larger holes. I also like the flavor and texture of bran instead of flour on the outside. 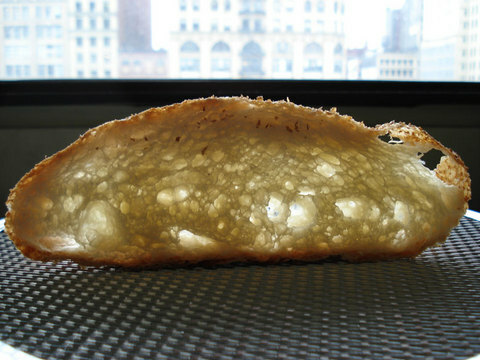 I intend to try these techniques with my pugliese recipe which has a slighter higher 80% hydration and different mix of flours. Two important caveats to the Times' recipe: I watched the video on the Times' website and noticed that only 1-1/2 cups of water was used, not 1 5/8 cups as was listed in the printed recipe. The 1 5/8 cups, which is 1-1/2 cups plus 2 tablesopons, constitutes an extra 2 tablespoons of water bringing the hydration to 82% as opposed to 75%. Using the 1 1/2 cups of water the dough will be much more manageable, especially for those unaccustomed to handling very sticky doughs. Also on the video it was recommended that an oven temperature of 500°F. 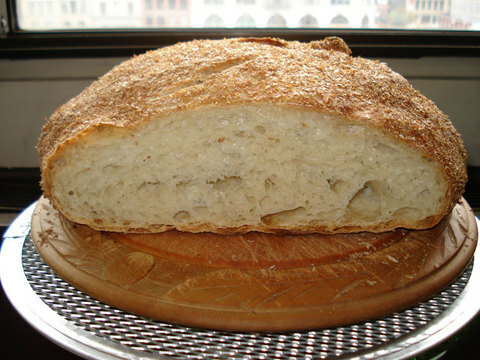 or even higher be used to bake the bread but in the printed recipe a more reasonable 450°F. was listed. I hedged my bets, used 475°F. and after 30 minutes of baking the bottom became slightly over browned toward the blackened stage. (Some people like their crust this dark.) Also, the bread was fully baked (210°F. internal temperature) and the top crust beautifully browned without the need to continue baking it for 15 to 30 minutes as was indicated in the recipe. I usually wait a week before making any recipe from a newspaper to see if there are any corrections because a weekly paper is under such a heavy deadline pressure there are often little or big glitches! In this case my eagerness to try it overcame my good judgment but luckily someone sent me a link to the video. And that's the beauty of the baker's % and weight. Realizing that I had used too much water, all I had to do was rebalance the dough by gently stirring in the additional flour to bring it to 75% hydration and the extra yeast and salt to balance the extra flour. As you can see from the photos--no harm done! 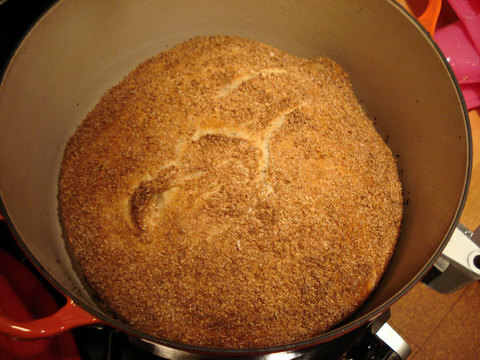 For those of you who may not have access to the article, the basic technique is to stir together the flour, yeast, and salt and then gently stir in the water for a few seconds--just until the flour is moistened to form a soft shaggy dough. The dough is then covered with plastic wrap and allowed to rise at around 70°F. for 12 to 18 hours or until the surface is filled with bubbles. The dough is then scraped onto a floured counter and with floured hands, shaped into a ball by folding it in thirds like a business letter in one direction and then repeating this in the other direction. It is inverted onto a towel which has been dusted with bran or flour. 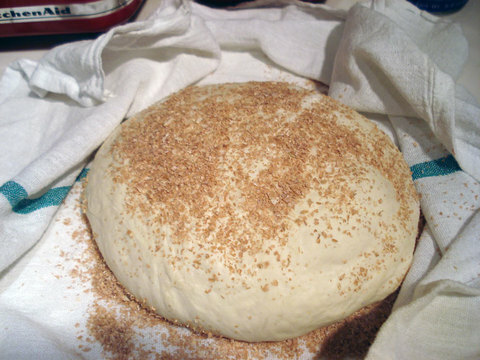 The dough is then dusted with bran or flour and loosely wrapped in the towel. It is left to rise for about 2 hours or until when pressed with a finger tip the depression fills in slowly. The risen dough is then inverted (seam-side up) into a preheated 6 to 8 quart enameled cast-iron Dutch oven and covered with its lid. (Or as I suggested above, inverted onto a piece of parchment, set onto a baking stone that has been preheated for at least 45 minutes at 450°F. and steamed with a handful of ice cubes thrown onto a preheated cast iron pan set on the floor of the oven (if you forget to preheat it you can do so on the cooktop). Finally, I am grateful to The New York Times, Mark Bittman, and Jim Leahey for doing so much to get people excited about baking bread. I could see from the video that Jim Leahey's mission, like that of any good baker, is to get people making and eating good bread.